Returning from the "backburner" to front and center for a long awaited revival of one of rock's most successful sister acts, the Heart's beating again. Alive In Seattle features the Wilson sisters return to their roots for last year's "Summer Of Love" tour, capturing the spirit with this two-hour, two-disc live audio documentary. After a million selling career that saw them rise among the ranks of the rock n' roll elite, the band disappeared for a good part of the '90s, save for the exceptional appearance here and there, to spend time pursuing individual ventures performing, scoring films, saving their breath basically. With a new band in tow, Ann and Nancy appear with a renewed sense of purpose that allows their many classic hits to stand the test of time and come across as significant as the day they recorded them. Save for the expected crowd noise, it's difficult to distinguish "Seattle" from a fully housed amphitheatre or four feet away from your living space, it's that effortless and clear. Two-discs and nineteen tracks mark this career spanning collection of early age oldies, obscurities, can't miss hits, and a few new tunes that blend right in with the rest. Biggest fanfare comes in the form of the opener "Crazy On You," which Ann stretches to the limits, a double up acoustic set of "Alone," and the surprising "Dog & Butterfly," Zep's "Battle Of Evermore," "Magic Man," and of course, "Barracuda." Far from the expected "Greatest Hits" monument that most returning legends ease into, Heart wastes no time to test the waters. They jump right in with the crowd pleasing "Crazy On You" before thrashing about unexpectedly, rushing in a newbie, "Sister Wild Rose," a quiet cover, "The Witch," an early favorite, "Straight On," and then maintaining a well balanced mix of yesterday and today that leaves the listener, and apparently the crowd, awed and fulfilled at once. The three new tracks are unmistakably Heart but neither in their classic-era "Crazy--" sense nor the '80s Pop idol variety, although "Break The Rock" makes an admirable run for Arena-Rock glory with its sing-along chorus! Ending the set by stepping back to the beginning with "Dreamboat Annie (Reprise)" was a bit bewildering, yet for all its mellow charm, evoked a sustained crowd reaction when one might otherwise expect more from "Barracuda" or even Zep's beloved "Black Dog," which actually came beforehand. Such goes far in exemplifying Ann Wilson's continued ability to hit the high or stretch the soul as it were, her delivery remaining as seamless as ever before. The band ignored mostly all of their 90's output save for a welcome rendition of "Wild Child" from the "Brigade" album. Great Rock song from an underserved album that got the expected silent crowd reaction but worthy of inclusion over the bubble gum fluff of another "What About Love" heel kick. 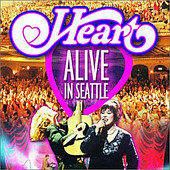 Some two and a half decades since the start, and another several years between live shows, "Alive In Seattle" proves for Nancy, Ann, and all their many fans, distance does indeed make the Heart grow fonder.